Recently, we answered the question: “What are hormones?” (Learn more in our post Hormones 101.) Today, I’ll tell you how to balance hormones naturally with a DIY supplement recipe. In this post sponsored by Perfect Supplements, I’ll give you a simple recipe to create your own hormone-balancing supplement. Scroll to the bottom for an exclusive coupon code! Why do women need to learn how to balance hormones naturally? Do you ever think about how unfair it is that men seem to have it easier than us? I mean, c’mon, they don’t have to be pregnant, deal with monthly cycles, postpartum bodies, or really any of the troublesome hormonal stuff we do. They also don’t get to experience the wonder that is harboring a child in your body for nine months, or the gift of natural birth. Those things are special to be sure, but they do pose some problematic hormonal changes for us gals. While men do experience hormonal issues of their own, due to women’s propensity to undergo frequent hormonal changes due to the above conditions, we are more likely to suffer from hormonal imbalances. Hormones are the chemical messengers of the body. They coordinate and control complex processes like fertility and reproduction, growth, and metabolism. They also have a strong influence in other areas such as the functioning of the immune system as well as in our mood, emotions and behavior. Hormones are pretty important stuff. If you’re not in a rush to try synthetic hormone replacements (or even the more natural hormone replacement therapies), you may wondering how to balance hormones naturally. Personally, I’ve recently added acupuncture to my hormone-balancing routine, but there are lots of ways to work on balancing your hormones. 1. Eat a healthy diet. Eat lots of good, high-quality fats like butter, coconut oil, and lard. Avoid processed foods and make sure you’re getting plenty of omega 3 fats like those found in fish and cod liver oil, and avoiding the less healthy omega 6 fats like those found in conventional cooking oils. 2. Use adaptogenic herbs to support your adrenal glands. Rhodiola is an excellent choice (read more about rhodiola here), and you can also make your own comprehensive herbal extract. 3. Improve your gut health. Sometimes eating healthy isn’t enough and you need to implement a healing diet like GAPS or go grain-free. A high-quality, effective probiotic is also key. I use this one. Using collagen everyday is also helpful to heal and seal a leaky gut. 4. Do gentle exercise. Stretching and walking are perfect when you’re working to support your hormones, as over-exertion can further stress the hormones. 5. Use the following daily DIY supplement. I recently learned about a new supplement that was designed specifically with women’s hormones in mind. I gave it a try and loved it, but it was a little pricey, so, of course, I decided to DIY it. 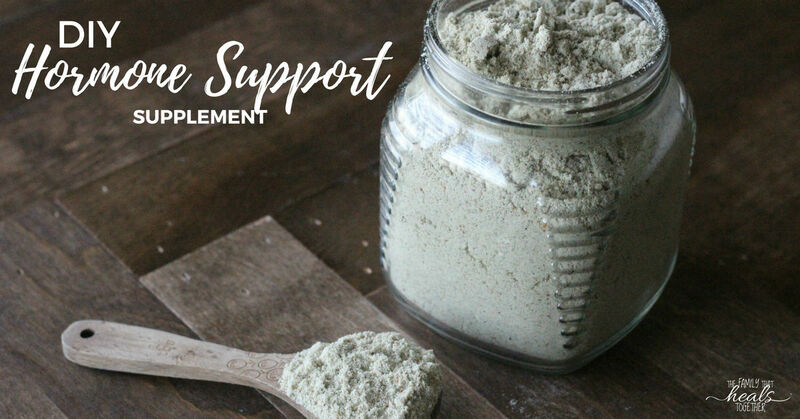 My favorite thing about DIY-ing supplements (like when I make my own herbal extracts), besides saving a boatload of money, is that I can customize them and add ingredients that I think will be beneficial, which is exactly what I’ve done here. Coconut milk has those rich saturated fats that help to support a woman’s hormones by giving her cells the nutrients needed to build hormones. It has the perfect balance of essential fatty acids along with saturated fat, the building blocks of healthy hormones. Collagen is one of my favorite food-based supplements, and for good reason. It’s packed full of amino acids, which help to balance hormones, and, in turn, neurotransmitters (aka those little things that control your mood- hello PMS!). Chock full of vitamins A, C, and K, greens are the bedrock of a healthy diet. But I’ll be the first to admit I don’t eat enough of them. 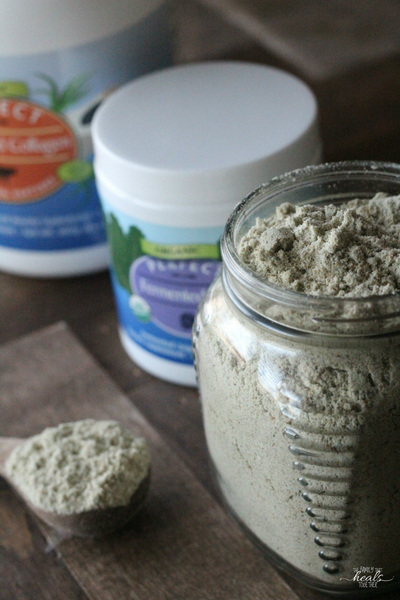 Easily get in a dose of daily greens with a powdered green supplement like Organic Perfect Fermented Kale or Organic Perfect Three Grass Blend. Dates are high in vitamin C, a needed nutrient to support the adrenal glands. Beneficial for trace minerals, as well as a great natural sweetener, date sugar is a nice addition to our DIY hormone-balancing supplement. An awesome source of trace minerals, and great for balancing the hormones, Himalayan salt boasts endless benefits. Ready to learn how to balance hormones naturally with this DIY supplement? In a large bowl, combine ingredients. If any ingredients are clumpy, sift before adding. Whisk to mix ingredients well and place in a large jar with an air-tight lid. 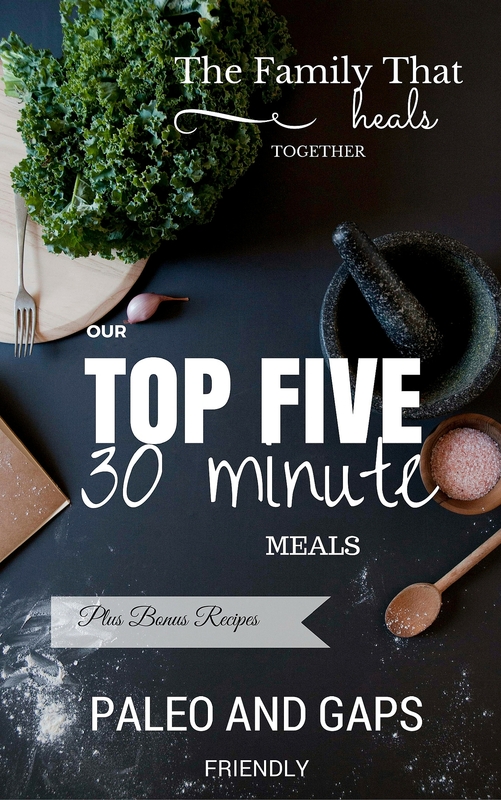 Store in a cool, dark place and add 1-2 tbsp to drinks or food every day. This amount should last 1-2 months, depending on how much you use per day. Add a tablespoon or two to a morning smoothie for ease of use. Try this super antioxidant smoothie recipe. Easily stir a tablespoon into your hot morning beverage of choice, such as coffee, hot chocolate, or, my favorite, chai tea. Add a little honey and raw cream for a hormone-healing latte of sorts. Because hydrolyzed collagen dissolves easily (unlike regular collagen, aka, gelatin), you can easily mix it into a glass of raw milk, juice, or even water. Add a scoop to your morning meal, whether you’re eating yogurt, oatmeal, or some type of cereal, this powdered supplement can mix right in. I honestly love doing every little thing I can to support my hormones, because supporting the hormones supports my overall health and happiness. This supplement is a perfect addition to my routine. 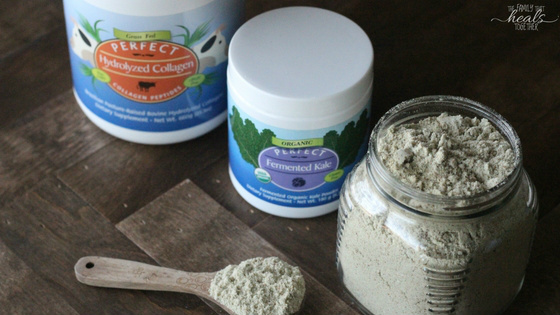 Want to get 15% off Perfect Supplement Grassfed Hydrolyzed Collagen and Fermented Kale Powder this weekend? Use coupon code FAMILYHEALS10​ for an extra 10% off Perfect Supplements’ already low prices, multiple item discounts, and free shipping for orders over $99. Shop here. Want to get 35% off?! Because Perfect Supplements offers 25% off orders of three items or more, you can order the Collagen, Kale or Three Grass Blend, + Grassfed Liver Capsules (one of my favorite supplements for better energy, and also great for the adrenals and hormones support! ), and, with the addition of the 10% off coupon (FAMILYHEALS10), get 35% off your entire order! Yeah! 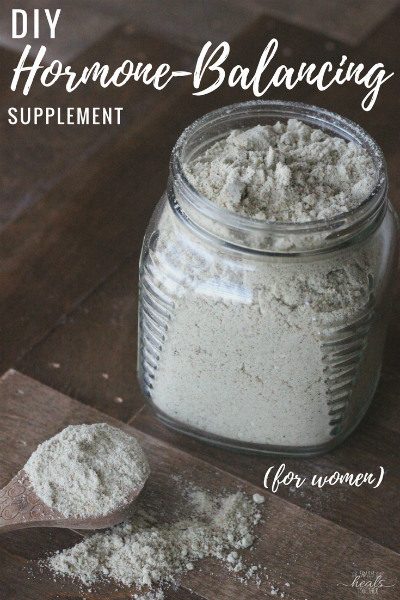 Do you have a friend who would love learning how to balance hormones naturally with this DIY supplement? How do you know that this has any effect on hormone levels? Well, Rosemary, short of testing my hormones, I guess I don’t. :p But I do know I feel better and more energized the days I take it, and according to my research, the ingredients contain nutrients needed for hormone support. I stumble upon your other article on dominance. I am currently struggling with it now. I will definatly try this recipe. Thanks for all the helpful info!